Once upon a time, there was a street artist who purchased a monkey in hopes of turning it into a performing monkey. This particular monkey was not very obedient and gave the street artist a very hard time. The artist had enough and purchased a chicken on the market. He would terrorize the chicken by beating drums and making awfully loud noises. When the chicken was frozen in fear, the artist took a cleaver and beheaded the chicken in front of his disobedient monkey. 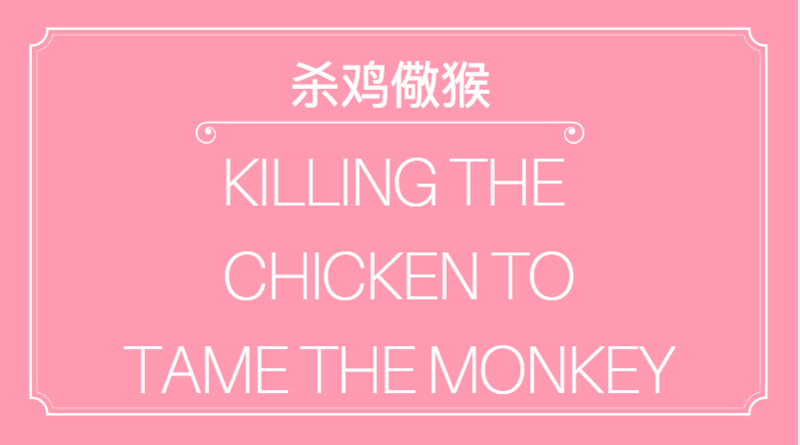 By making an example out of the chicken, the artist was able to tame the mischievous monkey who never stepped out of line ever again. Moral of the idiom: You might need to make an example of out something to prove a point. Also, fear (although not encouraged) might be the answer.